Russia’s Beriev Be-200 amphibian twin-jets will be given a new engine option in the second half of 2020, Alexander Artyukhov, head of the United Engine Corporation (UEC), announced at the Engine Forum 2018, held in Moscow in early April. The aircraft will be powered with SaM146 engines, which are produced by the Russo-French joint venture PowerJet and currently power Sukhoi Superjet 100 regional jets. “The timeline for the Be-200 re-engine project is third or forth quarter of 2020,” said Artyukhov adding that the powerplant will be a standard version of SaM146, but with a completely redesigned nacelle due to a different mounting of the engine on the wing. On Be-200 “the engine is located above the wing, so a large effort in terms of calculations and certification will be required. That is what defines the schedule,” he commented. Chief designer of the SaM146 at UEC-Saturn Georgy Konyukhov confirmed that Be-200 will receive SaM146-1S18. This modification has a take-off thrust of 7,332 kg, 5% more than the baseline model. It currently powers the SSJ100LR long-range version and SSJ100B-100 variant. A source in UEC told Russian Aviation Insider that the final agreement with the French partner, Safran, regarding the project may be signed in May at the sidelines of St. Petersburg Economic Forum. The technical possibility of adopting SaM146 for Be-200 has already been confirmed by the airframer and the engine maker. Be-200 currently uses D-436TP engines produced by Ukrainian Motor Sich, with 7,650 kg of thrust. Russian media earlier quoted deputy minister for industry Oleg Bocharov, saying that Ukrainian authorities had imposed a ban on supplying D-436 series engines to Russia which are also installed on locally made Antonov An-148 jets. 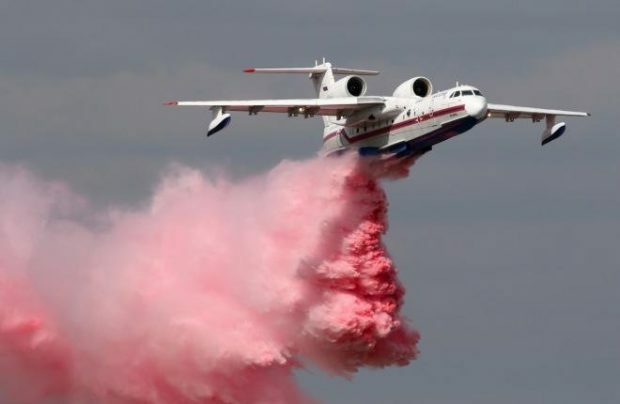 Be-200ChS amphibian is used by Russia’s Emercom for fire fighting and rescue missions. It has recently taken delivery of the fourth out of the six ordered aircraft of the type. The Russian military have also placed an order for six aircraft. Outside Russia, China’s Energy Leader Aircraft Manufacturing has signed a contract for two aircraft and Argentina’s Defense ministry signed an LOI for three aircraft.